WINSTON-SALEM, N.C.--(BUSINESS WIRE)--Hanes, America’s No. 1 apparel brand, has launched a social media challenge for fans to see if they are cool enough to hang with Michael Jordan. The “Chill Like MJ” interactive fan experience on social media leads to a sweepstakes entry for a chance to win an all-expenses paid trip to North Carolina to chill with the longtime brand spokesperson and six-time NBA champion. The winner will spend a day on the golf course, enjoy center-court seats at a Charlotte Hornets basketball game, and meet the legend himself during the game. The Chill creative campaign was created to support Hanes X-Temp product lines that incorporate technology designed to adapt to body temperature to keep wearers cool, dry and comfortable all day. 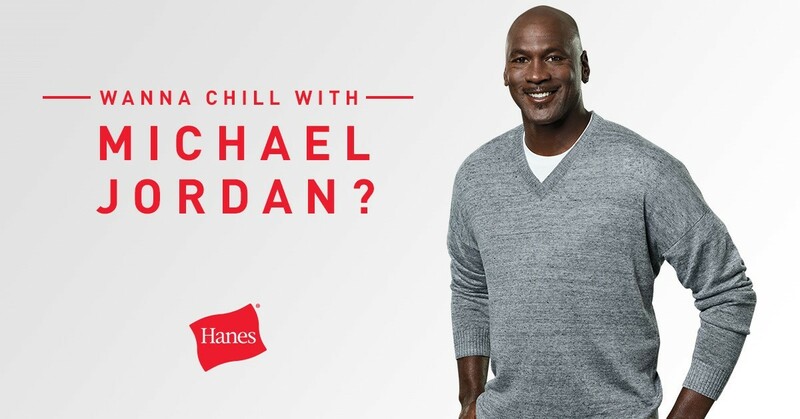 To enter the sweepstakes, fans participate in a “choose-your-adventure” interactive experience to see if they are “chill” enough to hang with Jordan. The game leads the viewer through different what-would-MJ-do scenarios and lets them choose different options. For example, does he help the guy struggling to bench press weights or just keep walking through the gym? ; does he steal the bride's spotlight or help get her groom back on track? In each situation, participants are encouraged to choose what they think Jordan would do. Based on participants’ selections, the experience guides them to the next scenario and ultimately to the sweepstakes homepage. The campaign is being executed through Canvas Ads on Facebook, Snap Ads, and a Facebook Messenger prank video featuring MJ. Consumers can enter the sweepstakes by going to www.Hanes.com/ChillLikeMJ. The sweepstakes ends Tuesday, Oct. 31, 2017. Hanes, America's No. 1 apparel brand, is a leading brand of intimate apparel, underwear, sleepwear, socks and casual apparel. Hanes products can be found at leading retailers nationwide and online direct to consumers at www.Hanes.com. Hanes is a flagship brand of HanesBrands (NYSE: HBI).